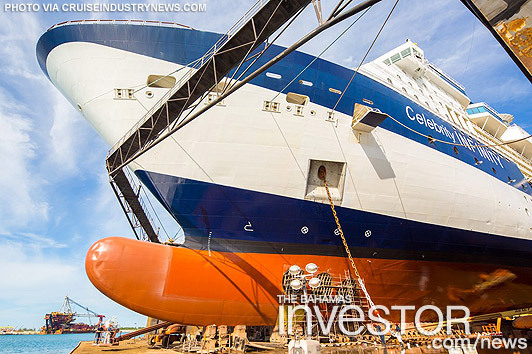 According to Cruise Industry News, Grand Bahama Shipyard, which sees most of the cruise drydock business in North America, has announced a number of investments and changes to its executive team. Read an excerpt from the industry blog here. Grand Bahama Shipyard, which sees most of the cruise drydock business in North America, has announced a number of investments and changes to its executive team. “We invested in our workshops by upgrading and purchasing machinery and tooling. Also expanded were our wet berth capabilities to relieve pressure off dry dock utilization and move vessels out of dry dock and into service faster,” said the yard in a statement. Both Carnival Corporation and Royal Caribbean Cruises are part of the yard’s ownership group. This is an excerpt from Cruise Industry News as it appeared on August 24, 2016. For updates or to read the current version of this post in its entirety, please click here. 16 Canadian Couples have won The wedding of a lifetime in the Bahamas 16 Weddings Invitation contest. With their special day three months away, couples are in the final stages of planning and finalizing the details. NewCo 2015 Ltd, recipient of the nation's second licence for the provision of cellular and data services, announced yesterday that 20 of its 22 planned cell sites have been fully constructed on Grand Bahama and are currently undergoing commissioning and testing.